Dealing with employee theft can be stressful and awkward. Not only is your restaurant losing money due to theft, but now you have to confront someone in order to put a stop to it. Fortunately, there are some proven techniques to handle employee theft management. Here are some step-by-step tips for what to do before, during, and after the conversation to prevent future offenses. If you want a successful resolution, preparation is essential. When you’re preparing, you should have clear goals in mind. Your first goal should be to eliminate the possibility that the employee didn’t know the policy or standard. It’s also important to understand if they can claim it was a mistake. Finally, when the rules are lax and others are stealing, the employee may feel they are being singled out. Your investigation should eliminate all of these situations. The first thing you should do is collect intel on the employee, and try to get as much information regarding the theft as possible. Locate their signature verifying they completed orientation and received the employee handbook. Look for previous documentation regarding behavioral issues, or cash and inventory loss. Collect, and review supporting documentation. This may include register tapes and POS stats (deletions, cancels, discounts, refunds). The investigator should always go back to see when the wrong-doing began or most likely began. Review DVR and surveillance footage. It’s best when you can match the transaction data with video footage. Establish the value of the loss (the number you want to get the employee to admit to). As best you can, establish how well the cash and security policies are followed at the restaurant. Before you conduct the investigation, it’s a good idea to suspend the employee. This will help you protect your restaurant and team from a further loss. It will also protect the employee if there are others involved. Sometimes these investigations take longer than expected, so suspending the employee will give you the time you need to conduct a proper investigation. After all of your initial research is done and organized, you’re ready to interview the employee in question. It’s important that you don’t make the employee feel uncomfortable or threatened while trying to get their cooperation. Following these steps will help you successfully interview the employee. When you conduct interviews, it’s important to always have a witness present, preferably one who is not that employee’s peer. Then, start by clearly stating the purpose of the interview, but be careful not to accuse the employee. Get them talking about the job, what they like/dislike about it, etc. After they’re comfortable you can introduce the topic. Speaking in broad terms is good to keep them from shutting down right away. For example, if you are talking about over rings or tickets, you can mention that you wanted to discuss suspicious $0 tickets or suspicious refunds. It’s also good to let them know that you are interviewing other members of the team. Now you can start asking questions more directly related to the theft committed while staying away from personal questions. Here is an example of the question order you might use. Ask if they are aware of a problem with excessive refunds. Have them explain their process for ringing in orders. Ask why a refund is needed. Ask who completes the refund (with the guest, it should be a manager). Ask if they’ve ever completed a refund without a manager present. With the prep work done, you already know the answer to this. Ask if they’ve ever used manager’s access (key, swipe card, password) to the register. Again, you will already know this. If they haven’t confessed to some level of wrongdoing, ask again, even explain that you have reviewed documentation and DVR footage, and ask what they think it shows you. Invite them to write out their view of the incident in a written statement. Reviewing the written statements is often helpful in identifying contradictions in their account or what others may have seen on know. And oftentimes helps the investigator get to the truth, faster. You can share some, but not all of your documentation. They may confess to a smaller amount. If so, then you can tell them you know exactly how much, but want the employee to say it or even guess. At this point, you should have some type of confession and can hopefully come to a resolution like a repayment plan. If not, you may have to turn this over to the local authorities. Thanking the employee, and making arrangements for repayment. If they refuse to take responsibility, it’s time to file a police report. Collecting the signed confession and preparing separation documentation to submit to HR. Escorting the employee from the building, if needed. 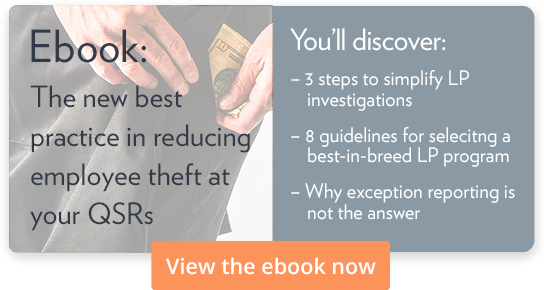 While dealing with employee theft is not enjoyable, it’s important to get as much information as possible. This will help you take steps to prevent future theft from happening. Finally, always get a signed confession because a verbal confession might not be legally enforceable. And, check out our restaurant loss prevention checklist for tips on how to prevent it in the first place.